Ten more routines with two decks of cards. 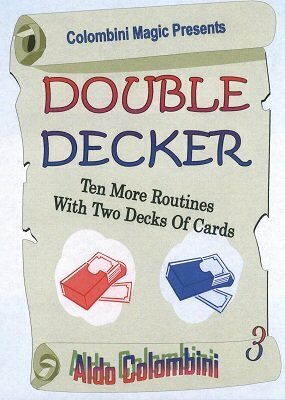 DOUBLE S'ENTENDRE (Ken Krenzel): Two decks and two spectators. Every action is performed with the decks in their hands. They pick a card and each spectator finds the other spectator card. INFLUENTIAL PAIRS (Karl Fulves & Roy Walton): A deck is shuffled and a spectator sorts the cards face up according to colors. You follow the moves of the spectator and at the end the colors have separated. UNSURPASSED (Aldo Colombini): A blue-backed card is placed in a red-backed deck. Three cards are removed from the red deck. The blue card vanishes from the red deck and reappears between the red-backed cards. DUP-LICATES (J. K. Hartman): A version of the traditional Do As I Do theme without the initial exchange of the decks. You and a spectator pick a card from two decks and they match. RED AND BLUE CARD TRANSPO (Harry Carnegie): Some cards are taken from a red deck and some from a blue deck. One card is switched and all the other cards follow their leader. THE RED AND THE BLUE (Alex Elmsley): Two decks of cards, one blue and one red. Each deck changes color except for two previously selected cards. TWO DECKS, TWO CUTS (Aldo Colombini): Two decks of cards are cut in the middle by two spectators. They find two matching pairs. The procedure is repeated finding two more matching pairs. PLUNGER COINCIDENCE (Chet): Two cards (say the black Fours) are placed on each side of a freely selected card in one deck. The two fours of the other deck are shown and placed reversed in the middle of the deck and capture the duplicate of the previously selected card from the other deck. MATE-HEMAGIC (Aldo Colombini): A deck is placed aside and from another deck two spectators each select a card. The duplicates of these cards are taken from the other deck and they are shown to have the same color on the back. All the other cards have different colored backs. SIGN PROOF (Francis Haxton): You sign a blue-backed card which is shuffled in the deck by a spectator. The spectator deals cards on the table until he feels to stop. Taking a card from a red deck, this is placed on top of the cards dealt and the deck is assembled. The card below the red card is the signed one.